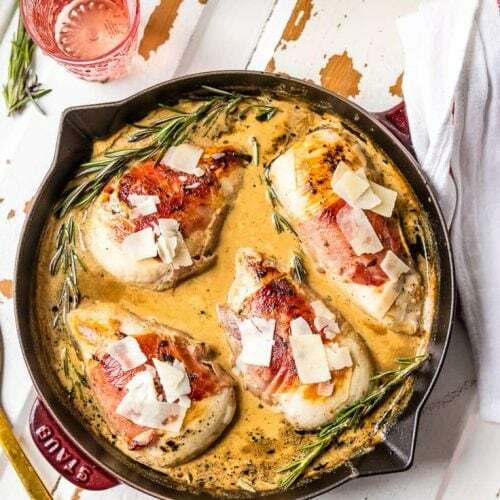 PROSCIUTTO WRAPPED SHERRY CREAM CHICKEN SKILLET is our favorite EASY and quick dinner! So much flavor and made in under 30 minutes. The cream sauce...I can't get enough! Season the chicken breasts with salt and pepper to taste. Wrap each piece of chicken with a slice of prosciutto, pushing down the edges to adhere. Heat the butter and 1/2 tablespoon oil in a 10" skillet over medium high heat. Swirl the mixture around in order to coat the entire base of the skillet. Add the chicken breasts to the skillet and cook for 3-4 minutes on each side, depending on thickness. You want the chicken to be browned on both sides and nearly cooked through. Remove from the skillet and set aside. Add the remaining olive oil to the skillet and saute the garlic for 2-3 minutes or until fragrant and translucent. Scrape the brown bits in the pan to the center as you cook, that's where all the flavor lives! Add the cooking sherry to the skillet and bring to a boil. Reduce to a simmer and whisk in the sour cream 1 cup at a time, until the cream sauce forms. Lay the rosemary into the skillet. Let simmer for 10 minutes. Place the chicken back into the skillet, nestled in the sauce. Bake, uncovered, for 5-10 minutes or until chicken is fully cooked and heated through. Serve with rice, pasta, or on it's own, spooning the sauce over the chicken.